Jo's Favorite Things: Halloween: Great Creepy Stuff on Sale! The ghosts have moved into this birdhouse! Creepy Stuff at Etsy has so much great Creepy Stuff that it was really hard to decide which pieces to feature. In addition to all of the great things you see below, there are voodoo dolls, a great collection of cards, a monster ring and a monster bracelet.. and other bracelets. 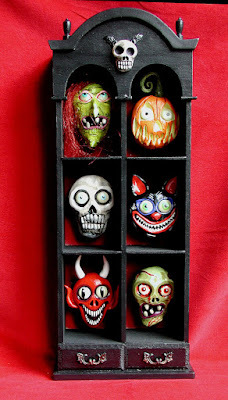 Not to mention the paper mache sugar skull jester rattle and many sugar skull pieces for celebrating Day of the Dead. Creepy Stuff is having a very un-creepy sale right now as well. I guess you will just have to link over to Creepy Stuff at Etsy today to see that stuff that I missed. At the top, a one of a kind ghost birdhouse fully renovated for the mini ghouls in the neighborhood with glow-in-the-dark ghosts, moss, toadstools and a tiny skull (perhaps to commemorate a tiny former occupant who has moved on to the spirit world?) 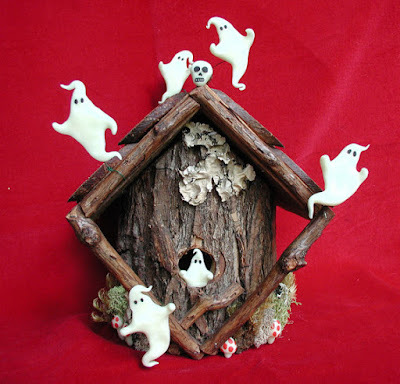 The ghost house is completely made of sticks & a log and is 7 1/4" tall and 15" in circumference. Details and purchasing information HERE. Sugar skulls are a tradition used in the celebration of the Day of the Dead (November 2nd) in Mexico and wherever people of Mexican heritage now live. Vendors sell the colorful sugar skulls during the days before the holiday. 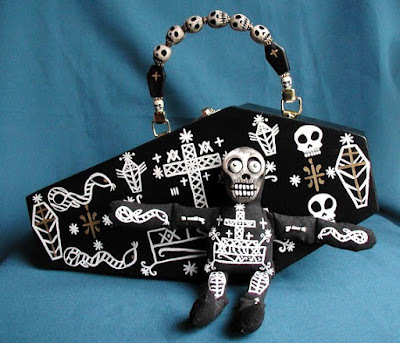 From the website Mexican Sugar Skulls: "Spirits of the dead are welcomed back to their homes with beautifully decorated altars made by their loved ones. Sugar skulls, marigolds, candles, incense and special foods adorn home altars." If you don't celebrate Day of the Dead, you'll want to link over to Mexican Sugar Skulls now. You can never have too many holidays to celebrate if you celebrate them with honesty and appreciation of the traditions behind that holiday. If you already know about and celebrate Day of the Dead, you'll definitely want to link to Mexican Sugar Skulls! Molds, information, socks (Yes, they do have Day of the Dead socks), a gallery of finished Day of the Dead sugar skulls and other treats await you. 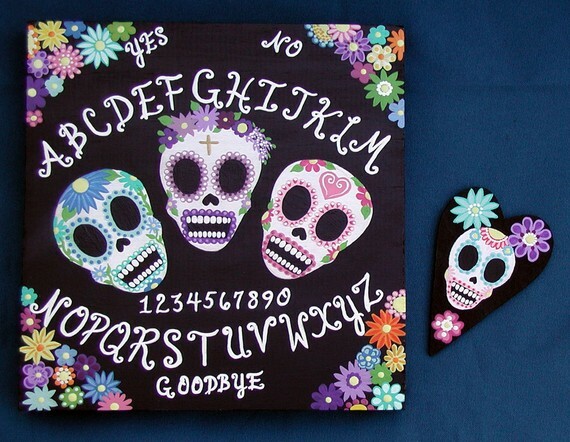 Here's an original, handpainted & handlettered Day of the Dead ouija board. It's small (about 7" by 7" and half an inch thick), so you can carry it and use it whenever you might feel the need to contact the spirits. It's made of acrylics on wood; varnished, with a matching planchette. It has felt pads, and can be used as a wall-hanging as well. They can be custom made; just check with the Creepy Stuff. Details and purchasing info HERE. Here are some creepy, one-of-a-kind monsters painted on wood blocks for a creepy Halloween touch to any hallway, doorway, or entryway. Use them to great the little ghouls and goblins who will come trick or treating to your house on Halloween. Each block measures about 3 1/4" by 3 1/4" plus the length of the chain. Details and purchasing info HERE. The first thing that caught my eye at Creepy Stuff was a shadowbox that has since been sold. I had to include a picture here because it is such a great thing. If you like it as much as I did, you may want to ask if Creepy Stuff can make a similar one for you. Perhaps if you promise tasty brains? You can sit that little cabinet right next to your Trick or Treat bowl. The marauding candy-eating spirits would love that! It's a one of a kind zombie & brain shadowbox. 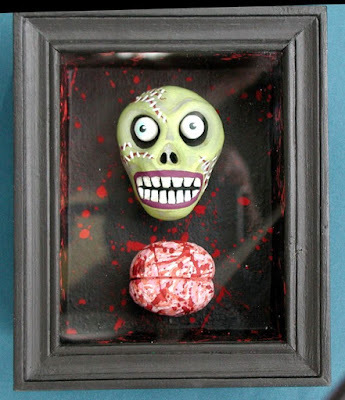 The zombie & tasty brains are made of handpainted polymer clay. Shadowbox is painted black & has "blood splatter" inside & out! 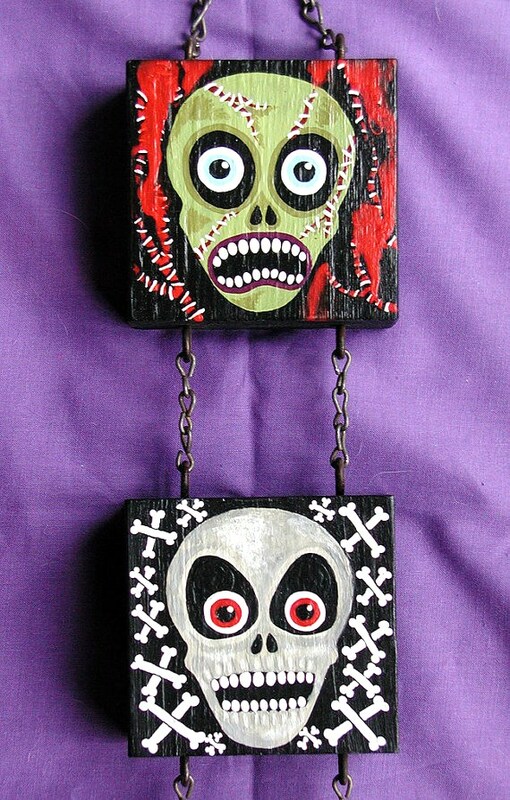 The zombie head & brain are suspended & appear 3 dimensional. Glass front. Varnished. Ready to hang in your entryway to greet those goblins! Details and purchasing info HERE. What could be more appropriate than a coffin purse to carry those essentials.. like blood red lipstick... at the next monster gathering? Painted black & adorned with the handpainted symbols for Baron Samedi, the handle is made with handpainted skulls & coffins beads. It includes a mini handpainted voodoo doll featuring the Baron's symbol and painted clay face. the purse is varnished & measures about 12" long by 6" wide at its longest point, about 4" deep. If this one sells, it will be gone, as Creepy Stuff will not make another one. So if you don't yet have your coffin purse, you will need to get it NOW! Details and purchasing info HERE. Creepy Halloween pins decorate everything! Finally, three handmade and handpainted Halloween pins. Decorate your coat, sweater, or hat for the upcoming haunting holiday. Or perhaps your curtains or pillows? 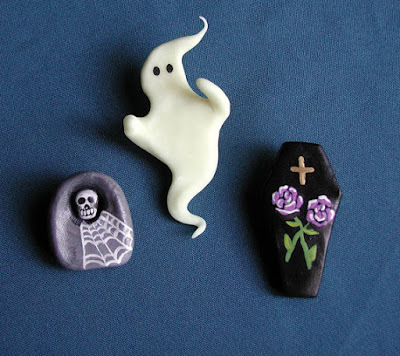 You'll get a glow in the dark ghost, a tombstone & a coffin. 1 1/4" up to 3"; Varnished. From Creepy Stuff. Hurry. Not much time left and things are going fast! Details and purchasing info HERE! It's Creepy Stuff at Etsy.. for some really Creepy Stuff!